Waldowood’s beginnings trace to Plasticville FM, a railroad town established in 1961 that, in turn, had been the successor to Lionel FM, a once mighty town that consumed most of a bedroom but that was junked in the name of 1960’s (HO) progress. 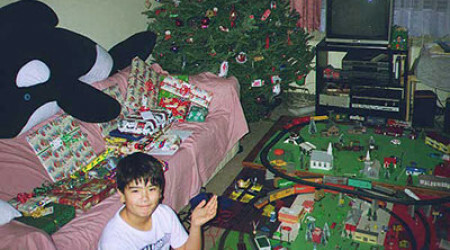 Plasticville FM was known for its strange "painted people", Christmas town square, and the Styrofoam Mountains, through which a Santa Fe freight train traveled. By the late 1970’s, the Styrofoam Mountains had vanished and Plasticville FM had been abandoned. What remained of the town, including its beloved Santa Fe Railway train, had been mothballed. By 1989, became clear that Waldo T Dinosaur would need a home base to support his ever widening set of activities. So, during the holiday season of 1989, Plasticville FM was taken out of mothballs, moved to Mr. Daddy Sir’s and Mrs. Mommy Ma’am’s bedroom, and rechristened Waldowood. 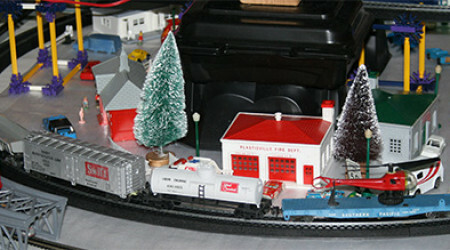 Waldowood had all the features of the Plasticville FM and some new ones: an animatronic holiday display (courtesy of “Best Man” Mitchell), a complex, two-line Santa Fe Railway system, and a major highway system that led up to and through Mt. Waldo. Having survived several relocations, Waldowood Train Village is bigger and better than ever–so much so that the train village has its own webpage–the one you are reading right now! To learn more about Waldowood, click on the links below.